I'm so excited to be doing this interview with Kate Motaung today! 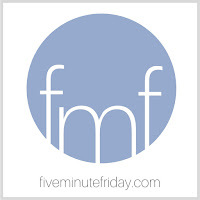 I first met Kate through a really fun online community for Christian writers called Five Minute Friday, where bloggers from all over the world join together each week to write for five minutes on a one-word prompt. This community of writers had it's beginning in just one woman, Lisa-Jo Baker, who began with the simple discipline of taking just five minutes to write a post...no editing...just free writing. "Not a perfect post, not a profound post, just an exercise in the discipline of writing." It began in 2011 with Lisa-Jo and bloomed into a community of writers all linking up on Fridays to write a five-minute post. In 2014 Lisa-Jo handed the reigns over the Kate Motaung. At this time I began getting to know Kate through the FMF community as she took over the hosting responsibilities. 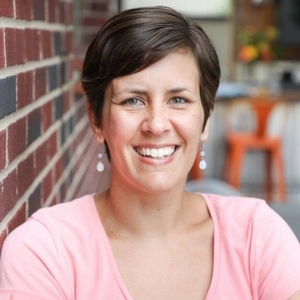 Since then, I have had the privilege to serve on Kate's Launch/Beta tester team for her e-course, Start-Up Guide for Online Writers, offered through First Bump Media Learning Center. Which, by the way, I would highly recommend for online writers. I'm not the most disciplined writer, but some of my most widely read posts have been those I have written for the Five Minute Friday link-up. I love being a part of this community, even though it has been hit and miss for me as to when I might actually get a post up on a Friday. I hope to get a bit more consistent in the future. 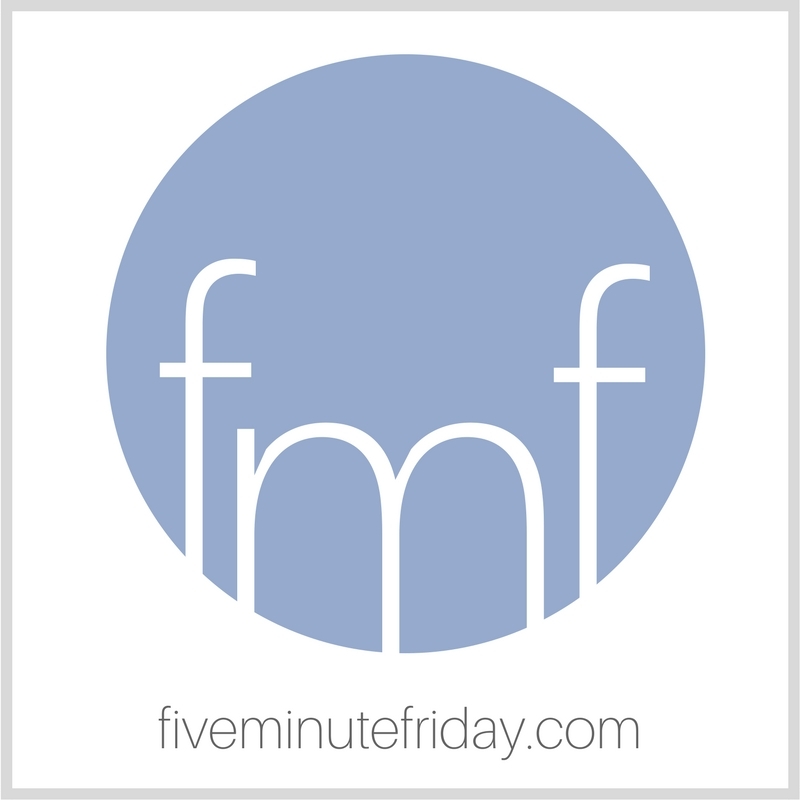 Kate has grown the FMF community from a Friday link-up to a full site that gives online writers so much more than the opportunity to write together for 5 minutes each Friday. It also offers a plethora of articles and resources for writers to use to hone their writing skills. Kate serves as hostess, teacher, coach, and cheerleader as she leads this community. A group of writers who use their gifts for His glory...five minutes at a time. I am so excited to introduce you to her latest book...her memoir...through this interview. 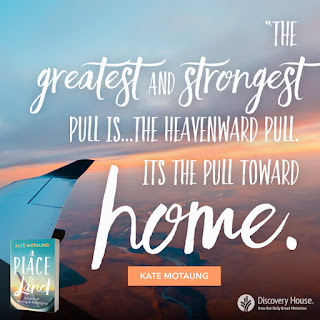 A Place to Land: A Story of Longing and Belonging is a globe-spanning memoir that wrestles with the question, ”Where is my home?” Kate Motaung watched ”home” slip away again and again–through her parents’ divorce, a foreclosure, two international moves, ten rental homes in ten years, and her mother’s terminal battle with cancer. Add in the challenge of a cross-cultural marriage, and Kate was constantly adapting to a new environment. Through her experiences, you’ll realize–as she did–that no matter where we go or what we do, this world is not our home. 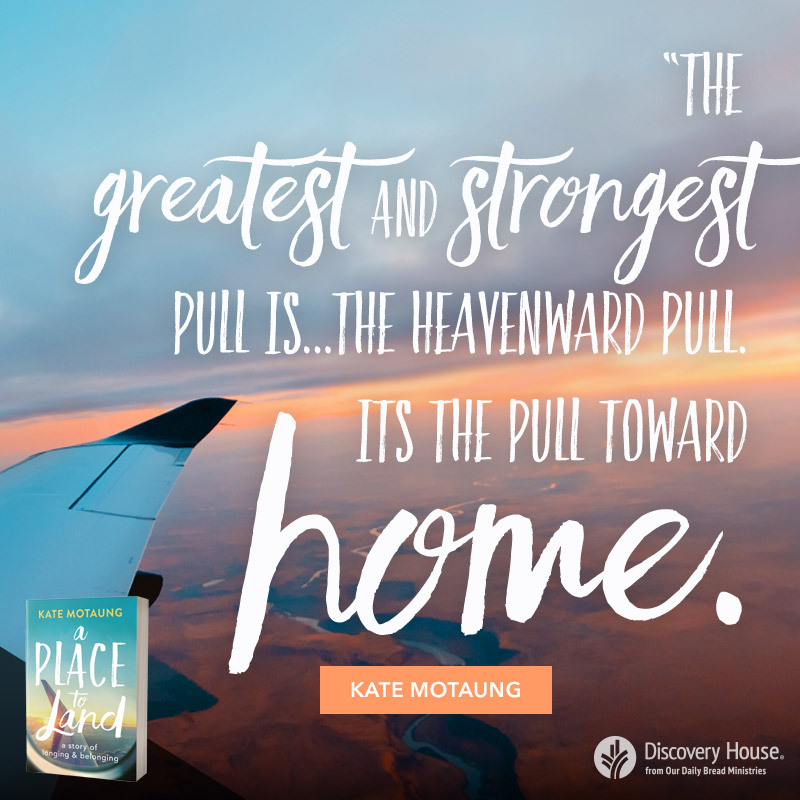 Please, welcome Kate Motaung, author of A Place to Land: A Story of Longing and Belonging, A Start-Up Guide for Online Christian Writers, and Letters to Grief. She is the host of Five Minute Friday, an online community that encourages and equips Christian writers, and owner of Refine Services, a company that offers writing, editing, and digital marketing services. Kate grew up on the shores of Lake Michigan before spending ten years in Cape Town, South Africa. She is married to a South African man, and they are currently living in Michigan with their three children. 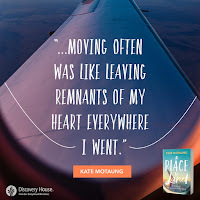 In addition, Kate blogs at Heading Home, Where she writes about a wide range of topics including parenting, grief, diversity, and book reviews. In all of her writing, her main goal is to encourage readers to keep an eternal perspective. To remember that "we’re just pilgrims here — just passing by on our way to our forever home." A Place to Land is a memoir, so readers can expect real-life storytelling. They can expect to travel with me from my childhood in Michigan to my young adulthood in Cape Town, South Africa. I should also warn potential readers that the book does walk through some difficult topics like divorce, my mom’s cancer diagnoses, and her eventual death. It is a heavy book, but my prayer is that readers will find it therapeutic to reflect on their own difficult situations (even if it involves tears in the process) and that eventually, they will land in a place of hope. How did writing your memoir change or challenge you spiritually? Writing memoir is an incredibly sanctifying process. For one thing, there are so many steps involved in writing a book of any kind—planning, writing, editing, revising, waiting, trusting, sending, giving, laboring some more, promoting . . . the list goes on. I expected that writing and publishing a book would be a monumental task, but going into it I had no idea how much it would stretch and grow me spiritually. With memoir in particular, because the story itself is your own, many emotions get tangled up in the process. I struggled to know which stories to include and which to leave out—what would strengthen the main theme? What would resonate with readers? Which stories will fall flat? Which sections do I want to share out of my own pride, and not because they will benefit my reader or contribute to the goals for the book? I had a hard time trying to discern how much of my story to tell without telling too much or too little. Doubt came into play, and I questioned whether anyone at all would benefit from the finished product. Then during the editing process, it’s very easy to take the editor’s suggestions personally. Thankfully, I was blessed to work with some incredibly gracious editors. I never felt as if they were condescending, disrespectful, patronizing, or flippant. They carried my story with grace and support, while still offering helpful suggestions to make the book stronger overall. I never felt as if my voice was removed, altered, or stepped on during the editing process, but I can imagine that for other authors, it might be really hard to hear a professional in the field tell you that certain aspects of your story aren’t worth being published. During this stage, it’s important to swallow your pride and humbly accept advice from others. When it came to making revisions, there were days when I felt that I had nothing more to give. If I had already put my best foot forward in the first few drafts, what else did I have to offer? I would stare at my screen and not know what to do. This phase really forced me to increase my dependence on the Lord. I had to trust that whatever words He wanted in the book, He would keep there, and whichever words He didn’t want would be cut out. As I neared publication and my first readers got access to the book, the dark clouds of fear threatened on the horizon. What would people think? Would they think the book was a waste of their time? Would they think the quality was poor? Would they think my story was boring or too sad or self-consumed? At this point, the Lord continually reminded me that it doesn’t matter what others think. Though this is a lesson I need to learn on a daily basis, I keep going back to the truth that only God’s opinion matters. If I’ve offered my best to Him and for His glory and not my own, nothing else matters. So I guess looking back, the whole publication process is one big exercise in faith— trusting God to open doors and lead the way as He sees fit, and for His purposes. What do you hope readers gain from reading A Place to Land? I don’t presume to have any idea as to what heaven will be like, except for what Scripture has revealed to us. But I do think that the vast majority of us have a diluted, lukewarm view of eternity. We lack a depth of eager anticipation, and I believe that negatively affects our choices and attitudes in this life. I’ve learned through writing this book that intentionally keeping an eternal perspective at the forefront of my mind does wonders for my countenance, attitude, and actions. It has changed me in ways I never expected. Where can readers find you online or hear more about your story? I’d love to connect on my blog, Heading Home, or on Facebook, Twitter, or Instagram. Interested readers can read the first chapter of A Place to Land here or on Amazon. Kate, Thank you! It has been such a pleasure and a blessing to have you on the blog today! If you have any questions for Kate, leave a comment below. I'm sure she would love to hear from you. I would too! Thank you so much for hosting me here, Gay! You are a gift! It was a pleasure and an honor! You have been such a blessing to the entire FMF community and to me! Thank you!